Sold by roll. 100 feet per roll. 100 feet is 3,048 cm. Nylon Webbing is a strong and durable type of webbing, commonly used in making sports products, pet leashes and collars, luggage straps, and safety belts. 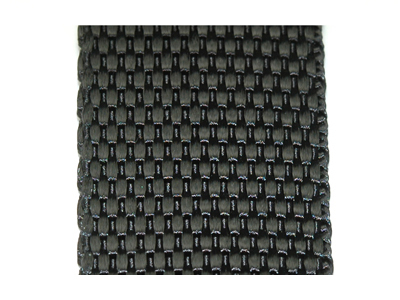 Nylon webbing is great for high abrasion applications. It is not recommended to use in or around water continuously because it absorbs water quickly, causing mildew and rot if not taken care of. Nylon webbing will also stretch up to 2% of its length when the webbing is saturated. 3/4" Breaking Strength 880 lbs, 400 kgs. 1" Breaking Strength 1144 lbs, 520 kgs. 1 1/4" Breaking Strength 1892 lbs, 860 kgs. 1 1/2" Breaking Strength 1650 lbs, 750 kgs. 2" Breaking Strength 1980 lbs, 900 kgs. Breaking Strength can be varied with respect to individual applications. These figures are offered as reference only and are not to be used as guaranteed performance figures. Products should be tested in their specific application. 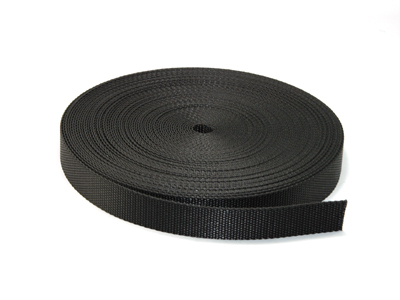 3/4" Webbing Thickness 0.049 inch, 1.25 mm. 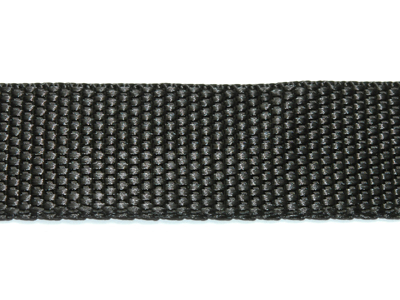 1", 1 1/4", 1 1/2" Webbing Thickness 0.047 to 0.051 inch, 1.2 to 1.3 mm. 2" Webbing Thickness 0.059 to 0.063 inch, 1.5 to 1.6 mm.